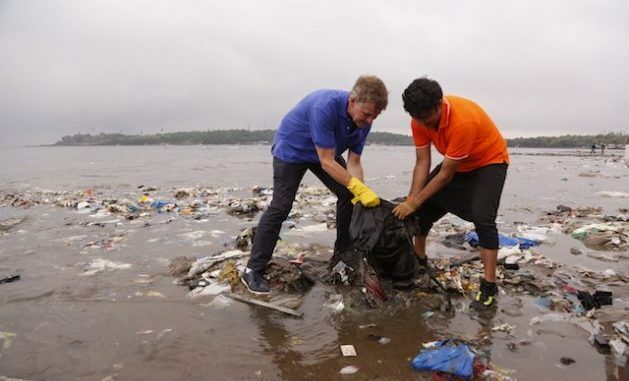 MUMBAI: Ahead of the World Environment Day, Erik Solheim head of United Nations Environment emphasised that it is not a war against plastics, but the focus is on its “smarter and safer use’’ with drastic reduction of ‘single use’ plastic Solheim will be in Mumbai at the Versova beach again on Sunday. This time to launch events for the 2018 World Environment Day which India is hosting. Excerpts from an interview Solheim gave the TOI. The theme this year for World Environment Day is Beat Plastic Pollution. What prompted this particular theme? Plastic pollution is something that hardly anyone was talking about two years ago, but it’s now emerged as one of the biggest environmental challenges of our time. To put it in simple terms, we’re drowning in the stuff. Of course it’s not plastic that is the problem, it’s how we have used and discarded it. People have become lazy and we are seeing the impacts of this throw-away culture. Plastic is in the stomachs of animals. Microplastics are in the water we drink. In Bandung province in Indonesia, the army was called to deal with what is almost a plastic berg in the river. An Army Chief referred to plastic pollution as the biggest enemy we are combatting today.That says a lot about this environmental challenge. Last year at the UN Environment Assembly, nearly 200 countries recognized that we are fast becoming a plastic planet, agreeing to address plastic pollution. Now World Environment Day is the United Nations’ most important day for encouraging worldwide awareness and action for protecting our environment. And so this year in 2018, our aim is to Beat Plastic Pollution. Does India need to put better policies in place to tackle plastic pollution? India has recognized, like other countries in the world, the urgent need to address plastic pollution. But the magnitude of the problem is so enormous that we need action on multiple fronts. We need to legislate our future away from a plastic planet, we need businesses to change the way they produce, and take responsibility for where their products end up. And we need people to realize that there is no space left on land, or in the seas for plastic that is used for mere seconds. We all need to take a hard look at our lifestyles and stop using single-use plastic we don’t need! And you’d be surprised by how many such products you take for granted in your daily life, that are not needed at all. Many states across India have put in place different types of legislation, but good policies need to be accompanied by individual action as well. The Indian government recently in particular has announced many policies to tackle plastic pollution. Protected areas have been declared plastic-free. The University Grants Commission has directed universities to go single-use plastic free and the Environment Ministry has urged schools across the country to abandon all single-use plastic materials. We have recently come up with a law to ban certain plastic products. The regulation is under challenge before the Judiciary. What do you think is required to ensure reduction in plastic manufacturing. Is reduction in plastic manufacturing a solution to curb plastic pollution? I want to make very clear that the UN has not declared a war on plastic. Plastic is one of most useful things ever invented. Plastic makes life better, healthier and safer every day. The problem is how we use it, and where it ends up. What we need is to become smarter in how we use the material. Get the best out of it and prevent the worst. So for me, that means a significant cut in the use of single use plastics through better designs and more sustainable alternatives, and better recycling technology and a more circular production cycle. Realistically speaking do you think a ban is the solution to problem of marine debris . As the head of UN Environment ,Don’t you think we need to do more then Ban ? As I mentioned above, yes we absolutely need action on many fronts. We use 10 million plastic bags a minute, this is not a problem that can be solved by legislation alone. Our obsession with plastic has spiraled out of control. We need to change the way we live, and be mindful of our own individual plastic footprint. We need businesses to innovate, people often hear me saying that there is no environmental challenge we cannot innovate our way out of, and plastic is a great example of this. In some case we need a ban. But in every case we need innovation. UN Environment leads the global Clean Seas campaign, that brings together nations and businesses with the aim of engaging governments, the general public, civil society and the private sector in the fight against marine plastic litter. Over the next five years, we will address the root-cause of marine litter by targeting the production and consumption of non-recoverable and single-use plastic. To do this effectively, we need citizens to be aware, engaged and active in addressing the problem in their own lives and beyond. We are also giving a platform to hundreds of local organizations who are already doing important work on marine litter to highlight their efforts. By connecting individuals, civil society groups, industry and governments, UN Environment aims to transform habits, practices, standards and policies around the globe to dramatically reduce marine litter and the harm it causes. Last year you had mentioned how Versova. beach clean upstarted by Afroz Shah is the largest and most inspiring campaigns which ought to be emulated world over. With the beach significantly cleaner now thanks to the immense work done by Afroz and all the volunteers , what is the message that the clean up has sent out to the world. After 20 years, olive ridley turtles have returned to the beaches of Mumbai. What more powerful message do you need of the benefits of keeping a clean environment? Every weekend no matter where I am in the world, I follow happenings on Versovabeach. It is the incredible testament to the spirit and love that people have for our planet. As Afroz’s video so beautifully depicts, it is all about love for our seas and our planets that we need to tap into, and spur action. For me this action sends two clear messages around the world: firstly, we can and need to clean up our act. And secondly, the plastic will keep on washing up unless we change things at a more fundamental level in how we all live, produce and consume. Plastic Pollution must be be handled by plastic producers .This is the mandate of law in many countries. What Role can UNEP play to accelerate this process ? Beating plastic pollution is everyone’s responsibility. We see ourselves playing an important role in drawing attention to the circular economy approach to production. We throw away trillions in plastic, electronic and food waste. But imagine the opportunities if we viewed waste as a resource, an investment and as an employment provider? Taking a circular economy approach allows us to think bigger than we have ever thought before. Changing the way we produce and consume, could be the next big economic victory for India, a country that has scripted some of the biggest successes in recent years. Many Indian companies are already global leaders on sustainable practice, and they’re reaping economic benefits as a result. So I think policy makers need to be more confident that insisting on a more sustainable economic model is good for business. Appointment of UN Environment Goodwill ambassador is vital to carry the message of UNEP . why is it that only Film actors are made so ? Don’t you feel we need to go beyond this formulae? We work with a number of influential people across the world to spread the word on environmental awareness. We ask them to use the power of their voice for the environment. These include a cross section of people from Lewis Pugh, the extreme swimmer who is our patron of the seas, Ben Fogle the adventure sports enthusiast who has is just descending from Mount Everest as we speak having completed a zero waste climb; and people in arts and culture and business. In India for example, Vijay Sharma, the CEO of PAYTM is our Patron of Clean Air. So we work with numerous people around the world, powerful in their own right, to speak for this planet and to inspire action. The young kids cannot enjoy ocean and beach . The marine species have lost their habitat . What can UNEP do at the ground level to change this ? We need to encourage people to adopt the 3 Rs approach – -reduce, reuse, and recycle. First, ask yourself if you really need all that plastic. Do you need a straw for your juice? Do you need to wrap two apples in plastic? No you don’t. Simply start by getting rid of things you absolutely do not need. Two, reuse as much as possible. Carry your own bag when you go to the grocery store, use your own bottle in school. There are so many littles things you can do in your everyday life which can make a big difference. And Three, companies need to redesign products, so that we throw away as little as possible. The planet has very little shelf life left! There is no room for products that have a use for a mere few seconds and are thrown away. So we see our role as getting the As a global consumer marketing giant, I see India playing a very big role in the region and the world, going back to some traditional products and ways of living, some of which like recycling, India is already so well known for! Have nations done enough on policy front? No country has a policy of throwing plastic in the sea. Yet that is what is happening. So clearly, there’s a policy problem here! What are the most immediate measures required to beat plastic pollution. There are quick fixes, like single use plastic bans – in Kenya, for example, the ban on plastic bags has been a big success. So there are any number of policy quick fixes. But what we need to remember is that the ultimate aim of all this is upstream change. Plastic is the ultimate product, and the ultimate pollutant. It’s us who need to be smarter.